I have been doing my absolute best to inform the non-gunning masses about why we "heart" guns. I've been at this for almost two years, and have met tons of gun-girls like myself. I guess I had forgotten that there were still many people, outside the firearm community, who were not aware of the strength of the gun-girl movement. Not to worry, I was brutally reminded of this last week when a friend posted an article from Jezebel magazine on my timeline. 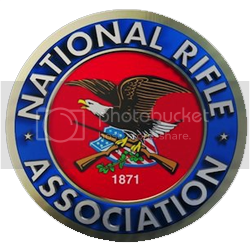 The writer, Doug Barry opened his article, NRA Convention Featured Pink Guns, Bra Holsters for the Ladies with the line, "GUNS!!!!! Right, ladies?? You like GUNS, don’t you?" dripping with sarcasm. He went on to describe how, unlike years past, this years NRA annual meeting, did everything it could to market to women. He specifically mentioned the Flashbang bra holster, but made the concept of a woman carrying a gun, sound like the most ridiculous idea anyone ever dreamt up. I have no problem with this writer being anti-gun, but I have to wonder, what was he doing at the NRA meeting anyway? We get that he's not the target market of ANY of the the vendors at the event, and he could attack it from any angle he wanted, but that's not what he did. He attacked women in general, proposing that we would never be interested in guns. Further, as a woman who is VERY interested in guns, I am offended by his whole sarcastic approach to a topic he obviously knowns absolutely nothing about. Late on Saturday, I was watching SNL when one of my favorite segments, Weekend Update, began. Seth Meyers began the skit by mentioning the NRA Annual meeting that had occurred the weekend prior. Within the bit, Seth pointed out how the NRA, atypically, had focused on the female-gun market with offerings like purse holsters. The punchline was predictably, "because the one thing that women are best at, is quickly retrieving anything from their handbags." Then he mimed a woman digging through her purse for entirely too long. There are plenty of funny observations I have made about the process of, as a female, trying to conceal carry. I'm no comedian, but I'm sure there is one out there who could work up a great routine around this topic along with many other tid-bits from the mind of a gun-girl. I know we are a small group in the grand scheme of American communities, but since we have now captured the attention of the mainstream comic population, I ask that we are given the same consideration as any other minority. As far as I know, it's generally considered bad form for redneck comedians to target city folk and 20 something comedians to glean laughs at the expense of 80 year olds. The general rule seems to be: unless you are one, have been one or have known a lot of them who have some innocuous little habit they are already willing to laugh at, leave it out of your act. a sense he was attacking the NRA's way of introducing women's carry options. guns and being proficient with them for themselves and not because of the guys. just as serious, proficient and respectful of firearms as any man out there. How inconsiderate of them! Making fun of women that enjoy guns and the NRA. Both have a right to own AND to advertise. Even if it's not able to be worn by or used by all. As a man, I won't ever own one. But my wife may like to have that option. How close minded can some people be?! I'm glad you said that. It's not that I was sooo offended by what they were saying, I was just sad that they didn't realize that gals like me have been around for a while now. Also, we've come so far, so fast with the guys within the firearms community, I forgot that there was a whole other group of chauvinists that needed conquering. Then my entire goal has been accomplished!!! Thank you!